As a female teenager, a lot of the books I read are romance ones. And I’ve read a lot of them. Therefore, I come across a lot of tropes. Good, bad, toxic, too good to be true. You know the deal. We all have a favorite trope. For some of us, those are cheesy and cliche and we’d never let a soul know them. For others, they’re cute and not too unrealistic and they’re just so cute. And some people, like me, can’t pick just one. So here are my top 10 favorite romance tropes. They’re not in order of favorites, I could never choose. This one is a definite classic for me. Two people start out hating each other. They would rather end up in the hospital than be around eachother. Or, they would fight to the ends of the earth to get the job promotion, get the better GPA, or get into the better college than the other one. And then, they suddenly start to realize ‘Hey, they’re kind of cute.’ And next thing you know, their screaming match turns into a makeout session. There is a thin line between love and hate. Definitely one of the best tropes. I usually prefer this one in movies. (Sweet Home Alabama, one of my mother’s personal favorites, is an example of this trope.) But it is quite cute in books. The gist is that one of the love interest returns to their hometown, willingly or unwillingly (but usually unwillingly), for a usually short amount of time. In these cases, either the other love interest is returning too, or they had never left. There’s many ways this could go, but my personal favorite is when they both return to their hometown for a wedding or reunion, have some sort of competition where they try to prove who has the better new life, and inevitably fall in love. Now this one is a guilty pleasure. Alpha Hero is a trope where there hero is “Type A” – he’s driven, assertive, and in control of the world around him, and then his love interest comes along. We’ve all read it, swooned over it, and then hoped we’d find a man like him. If you’re going “Nah, that’s so cheesy! I’d never read that!” – you’re a liar and I condemn you. These are fun and anxiety inducing and usually an overall good read. Disguise is a trope where one love interest pretends to be what they are not – royalty, an expert in the workplace, rich – but they fall in love while is disguise and are forced to maintain the ruse. This is a cute trope in both movies and books but they usually end in the other finding out that they were in disguise all along. It has some angst, but in the end they usually get together and live a long happy life. This trope is extremely popular. Kasie West recently wrote a book with this trope. You can find it in almost every TV show and movie you watch, and in a lot of books. Friends to Lovers. Friends to Lovers is a lot like Enemies to Lovers – but they don’t hate each other. Instead, they are actually friends! One love interest secretly pines over the other, not knowing that the other one is doing the same to them. They never admit their feelings until a series of events usually including jealousy, parties, and going to college forcing them to face and admit their feelings to the other. A lot of times it includes the girl admitting her feelings, running off before the other can admit their feelings back, crying, and then lots of kisses. If you’re like me, no matter how many times you’ve read books with this trope, you can’t get enough of it. Oh no! Your family is coming to town, including your nosy aunt who constantly nags you about getting a boy/girlfriend! What do you do about it? Deal with it? Ignore her? Of course not – ask your fe/male best friend to pretend to be your boyfriend! This is pretty much the first couple chapters of the Fake Relationship trope. Someone needs to convince other people that they’re in a relationship, so they fake it with a friend. But of course, all that cuddling, fake kissing, and hand holding can really put a burden on ones emotions when their best friend is a total hottie. So they fall in love. They ignore it, and act like its just because of that cuddling, fake kissing, and hand holding. Then the family leaves town. And they find themselves standing there, still wanting to make out with their best friend. So they do, and it all ends happily ever after. It may sound extremely cheesy and basic but I promise you – well it is cheesy and basic. But its also super cute and I love it. I refuse to apologize. One of the love interests has a reputation for playing the field, seeking out sexual relationships without any emotional attachment – until s/he meets his/her one true love. Like I’ve said about many of the others, this is a big and popular trope. It actually shows up in one of my current favorite TV shows – Lucifer. They don’t see any point in love, and they hop from wo/man to wo/man. But then they meet the other love interest. And then suddenly that hot bartender they would normally hit on just doesn’t seem that appealing. It is quite one of the cutest tropes ever created. It’s so lovable. Last, but not least – Secret/Lost Heir. One of the classic tropes. In fact, the Disney movie Rapunzel, has this trope. One of the love interest is the secret or lost heir to a great fortune, kingdom, buisness, enc. They usually don’t discover this until the other love interest is introduced and helps them find their way. A lot in times, more common in books than in Disney Princess films, the love interest gets swept up in all of the riches and glory that they almost forget about the other love interest, which really ticks that love interest off. But of course, they get back together and live happily ever after. There you go! These were my Top 10 Romance Tropes! Let me know if you liked it! Also make sure to comment your favorite tropes below – I might make a part two! Hi! So it’s been a long year. A realllyyy longgg year. So much has happened in 2017 so I decided to write a year-in-review! Nothing better than realizing that you haven’t read as many books as you feel you should have! In 2017 I have read 47 books and am finishing my 48th currently. (The 48th will not be included in this post, since I have not finished it yet.) This is actually beating my goal, since my goal was 45. I chose this goal because when signing up for the challenge I had no idea what number I wanted to hit, so I set it to 45 since Goodreads said it was the average number of books people had chosen for their Goodreads goals. Now it’s time to find out what book I started out this mess of a year reading.. and that book is…. The Eternal Ones by Kirsten Miller! I actually love this book so much. I’ve reread it so many times. (That actually might of been a reread?) Yet it’s part of a series. and I’ve never bothered to pick up the next books. Oops? Now the last – Well, not the last. Like I said, I’m reading another book right now and might end up reading another before the year ends. But just bear with me. – book I’ve read this year was…. The Little Book of Skincare by Charlotte Cho. Not the usual book I’d read, I know. But lately I’ve been obsessed with skincare. My skin care regime currently takes up 20 minutes everyday and I’m constantly looking for ways to improve it. And Charlotte’s book has tons of Korean skincare tips which is awesome because like, have you seen Korean skin? Anyways, they’re all really useful so if you’re looking for ways to improve your skincare routine I’d definitely recommend reading this. Now, for the next part of this post I decided to do a bookish survey/tag of some sorts about the books I’ve read in 2017. Soo… here we go! Definitely A Court of Mist and Fury by Sarah J Maas. (Okay, I know I said “definitely” like it was an easy choice, but it was so not.) This book was apart of a series, but I love this specific book sooo much. Many of my favorite characters are introduced in this book, and my love for Feyre and Rhysand definitely formed while reading this book. (Well, I loved Feyre before, but I had more respect for her while reading this.) I’ve said this before, and I will say it again, if you haven’t read this series, read it! Each book is nice and long and will put you on an emotional rollercoaster. The Raven Boys by Maggie Stiefvater. I really procrastinated reading this one. I had gotten it at the library multiple times because I saw it all over social media, left it in my bag, and returned it to the library without ever reading it. But one day I got an epub of it and decided to read it because I was on quite a reading streak. And I fell in love! This book was so original, had interesting characters, unpredictable plotlines, and great friendships. I don’t understand how I went so long without reading it! Caraval by Stephanie Garber. This book blew me away. You know those books where predict everything that is going to happen so when a plot twist comes you’re not really surprised? Well, that’s not this book. When you read it, you’re learning everything as the main character does. And when the plot twists come? You won’t be ready. This debut kept me on the edge of my seat with its dark fantasy like theme. The best debut I’ve read it a while, honestly. Suprise, Suprise. 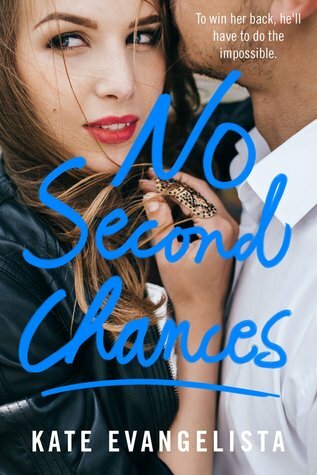 It’s No Second Chances by Kate Evangelista. You can find my review here. I hated this book. I had to force myself to read it because it would’ve been the 45th book I read this year and I really wanted to reach it. But at least it made for a nice rant. The only decent character was a little kid who was in the book for 15 pages, the storyline was predictable just by reading the back of the book and the love interest was a douche who did in fact, like the title says, deserve No Second Chances. Not a very good read. I read quite a lot of comics this year, so this one is hard. But after some thinking, I’m going with Batgirl Annual #1. Okay so, the main reason I’m choosing this is because my two of my favorite heroes, Supergirl and Batgirl, teamed up. Don’t blame me, Batgirl Annual #1 is my baby I’ll be using for the rest of my life. (Yeah, that was a Taylor Swift reference. Go buy Reputation, out now.) Barbara and Kara work so well together and are my little babies. 100% the best comic read of 2017. That’s all for now! I would’ve made the tag longer but I had the first have of the post and well, Christmas is soon. Speaking of that, Merry Christmas! So I’m back with Part Two of the Bookish Survey: Greek Mythology Style! It took longer than I said it would to post this, but that was because I got sick, along with the rest of my family. Anyways, let’s get started! This part of the challenge will include characters from Heroes of Olympus. Hope you enjoy! I hate to be one of those people who can’t get over a certain book series, but for this I’ve got to say Feyre Acheron from the A Court of Thorns and Roses series by Sarah J Maas. She’s super strong, and she has had the best development. When I first started the series I was a bit hesitant because I thought she was going to be overhyped, but she definitely was not. So because of that, she wins the title as my favorite protagonist. Harry Potter and the Deathly Hallows by JK Rowling. was my choice for this category. I love Harry Potter a lot, ok? So this series was definitely epic for me. Even the tear filled finale. It was amazing in the world of finales (even with the death of my favorite character – WHY FRED ? WHYYY!) so this book definitely deserves the title of Book With An Epic Finale. Ten By Gretchen McNeil! I found this book after someone recommended it when I was looking for book recommendations. I looked it up on Goodreads, read about it, and fell in love with it! But unfortunately neither the library nor any local bookstores has it. I would buy it, but I’m broke. So until the library decides to stock this interesting book, it’ll forever be stuck on my want to read list on Goodreads. Fun Fact: I don’t really read “humor” books. But I do sometimes find books with adorable, funny main characters that make me smile a little bit. So I’ll be telling you guys about one of those – Sunkissed by Jenny McLachlan. The main character – Kat – is adorably awkward and fun to read as she’s forced to go spend her summer in Sweden. On an island. With no wifi. She makes friends, attempts (and fails) to compete in a physical competition, and of course, meets a boy. Anyways, it’s adorable and I got a few smiles while reading this book. Adam Parrish from The Raven Cycle series by Maggie Stiefvater. Adam deserves nothing but happiness. I would die for him. Truly. Adam was a scholarship student, a trailer park boy in a school of trust fund guys. He had a terrible home life, and yet still managed to be so loveable and strong. I wish I could say I wasn’t crying as I typed this, but that would be a lie. Probably Azriel from A Court of Thorns and Roses by Sarah J Maas. From the moment he was introduced, I was intrigued. He had a very mysterious and dark vibe to him, and the amount of things I knew about him was very limited. It still is! I hope we learn more about him in the new novella because I’m definitely interested in learning about this dark and mysterious character. Elixir by Hilary Duff. While I’d love to read this since Hilary wrote it, I just can’t. I like to see what the reviews on Goodreads are before I read it, and this one had the worst. The highest one I’ve seen was three stars, and that’s just not workable for me. So because of that, I refuse to read. Natasha from No Second Chances by Kate Evangelista. Don’t get me wrong, she was treated badly by her ex boyfriend, but some of the things she did… were just plain annoying. One thing that irked me was when she attended her ex boyfriend’s brother’s engagement party…. and got mad when she saw her ex boyfriend there. “How dare you show your face here!” Sweetheart, this is his brother’s event. Honest to god, you have no right to be angry. She’s also annoyingly stubborn and bratty throughout the book, which does not help. I just can’t with her. So that’s the end of that! I was a lot of fun making this survey, so I hope you guys enjoy it as much as I did! This was originally published on hurricanebooks.wordpress.com but was moved to this domain. I absolutely love Greek Mythology. It might be from my love of the Percy Jackson series, or maybe just my love for knowledge, but I’ve always found it really interesting. So when I saw this survey over at Flip That Page that combined my love for Greek Mythology with books, I knew I had to do it. I mean, c’mon, they’re the best. How does it work? Well, Jasmine of Flip That Page made a list of 12 Olympians and characters from the Percy Jackson Series and Heroes of Olympus, and paired them with topics of books related to those characters. It’s my job (or yours – check out the instructions here), to pair those characters and topics with a book of my choice. The survey is a bit hefty, so I’ve decided to split it into two parts. This one, will obviously be the first one. Now, let’s get started!